Sonus Faber introduces Venere S flagship loudspeaker | What Hi-Fi? 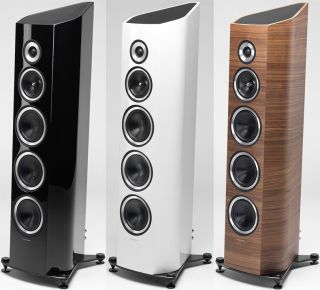 The new Venere S loudspeaker is the most powerful three-way speaker within the Venere range. Sonus Faber says the design remains "faithful to that of the six current models of the collection", but it has made some design adjustments. The most notable of these is a new design for the reflex port, which has been moved from the front baffle. Now sitting in the lower part of the cabinet, facing the floor, Sonus Faber says this will minimise interference with the listening environment and ensure the sound delivered is “not contaminated by the spurious vibrations generated by its powerful drivers". And those drivers are powerful. Sonus Faber has fitted the Venere S with three 18cm woofers, made of aluminium for maximum lightness and stiffness, for “the best reproduction of lower frequencies". The midrange drivers benefit from a Curv membrane, a special thermoformed polypropylene fibre that “provides the ideal solution for an absolutely natural reproduction of the main part of the audio spectrum". Finally, the tweeter features a soft dome membrane made of silk. It’s mechanically decoupled to help shield it from vibrations generated by the other drivers. Sonus Faber says this allows for “an extremely focused sound stage". The cabinet design mirrors that of the rest of the Venere range, although a new brushed aluminium finish around the drivers sets them apart. The glass base of other Venere speakers has also been replaced by a brushed black aluminium plate with a diamond edge. The Sonus Faber Venere S is available from September for £3798 per pair in black or white, or £3998 in a walnut wood finish.